The only fish I am really scared off. It is not aggressive. It is just so well camouflaged that spotting it requires experience. The lady I was diving with on that day took several minutes before recognising what she was looking at. 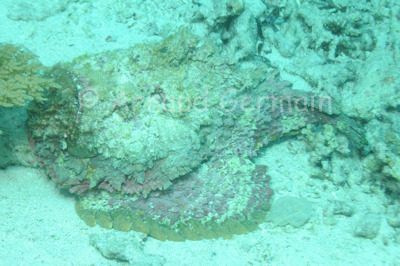 Stonefish have 12 very venomous barbs on their back. Nikon D700, Nikon 28-105 mm macro at 80mm, F8, 1/250th, ISO 400, Ikelite Housing and Ikelite DS160 strobe set on TTL. Satellite Reef, about 6 metres down, Ras Muhamed, Egypt.